Training In Vegetable Carving is an event that took place between 27-Jan-2006 and 29-Jan-2006 in Hyderabad. After this class, you will be assured of doing much more with your vegetables, than just using them in your pan. Ever observed people trying to make turbines out of tomatoes? You can call this art whatever you want, but for the time being, vegetable carving is in. Mr. Satyanarayana Rao, along with his team of floral sculptors, is out to make dinosaurs out of cucumbers. Well, if vegetable carving is an expression of creativity, then you can go to any lengths, like the one we just mentioned. Peerless arts such as this, do demand a lot of effort, and money, of course. But for Rs. 250, in three days, you will be assured of doing much more with vegetables than just use them for the pan. How viable is that? Only time will tell. Please contact 2329-9779/5559-1474 for further details. 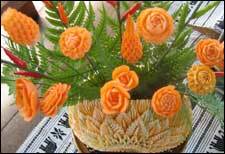 Be the first to comment on Training In Vegetable Carving! Just use the simple form below. fullhyd.com has 700,000+ monthly visits. Tell Hyderabad what you feel about Training In Vegetable Carving!